Senate Minority Leader Charles Schumer of N.Y. speaks at the 2017 American Israel Public Affairs Committee (AIPAC) Policy Conference, March 28, 2017, at the Washington Convention Center in Washington. Several U.S. lawmakers spoke Tuesday about the importance of cooperation between the United States and Israel, on the final day of the annual policy conference of the American Israel Public Affairs Committee. Senator Chuck Schumer said many younger Americans grew up knowing Israel as a strong and secure country, not witnessing the extreme violence present there during the 1970s and '80s. "The younger generations are blessed to know an Israel entirely capable of protecting itself," he said. Schumer said Israel has "come a long way since its early days," and he attributed a great deal of that progress to strong ties formed with the United States. One of the most important points of cooperation between the two countries, Senator Mitch McConnell said, is in the fight against Islamic militants in the Middle East. McConnell called for the rebuilding of military capabilities in the region and said President Donald Trump has taken the first step to make that happen with a recent budget proposal that included a $54-billion increase in defense spending. "The best way to enhance security in the region is to enhance America's influence in the region," he said. 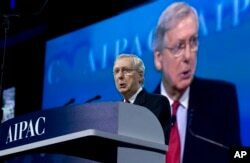 Senate Majority Leader Mitch McConnell of Ky. speaks at the 2017 American Israel Public Affairs Committee (AIPAC) Policy Conference, March 28, 2017, at the Washington Convention Center in Washington. McConnell reiterated his opposition to the deal struck by the U.S. and five other nations under former President Barack Obama's administration to curb the Iranian nuclear program. He said the deal gave Iran billions of dollars to funnel to terrorist groups and ignored "other aspects of Iran's aggressive behavior." "Our enemies learned not to fear us, our friends learned not to trust us, and countries like Israel felt abandoned," he said. Schumer called Israel the "Silicon Valley of the Middle East," and said American technology firms are increasingly traveling to Israel to learn how to protect themselves. One issue still threatening the world's Jews, Schumer said, is "cloaked" anti-semitism that comes in the form of holding Israel to a different standard than other countries. Schumer slammed a United Nations standing agenda item that requires the Human Rights Council to debate Israeli human rights abuses against Palestinians and asked rhetorically of "social justice crusaders" about their lack of outrage against Iran. "Where are your boycotts against the Arab nations where journalists are routinely jailed?" he said. 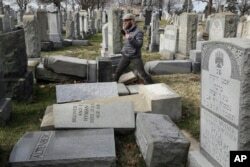 In more overt shows of anti-Semitism, Schumer said neo-nazi gangs are more active in the streets of Europe and mentioned a recent wave of bomb threats that, "regardless of the suspect's race and nationality," have struck fear in Jews across the country. "Fear mongering, intolerance and intimidation will not be condoned," he said. Police in Israel arrested a Jewish man last week in connection with more than 100 bomb threats called into U.S. Jewish community centers in recent months. Senators Kamala Harris and Robert Menendez, along with House Democratic Leader Nancy Pelosi also addressed the conference Tuesday. A day earlier, Israel's Prime Minister Benjamin Netanyahu said the two countries must stand together to ensure "light triumphs over darkness and hope triumphs over despair." Netanyahu called on the United States to "vanquish" the Islamic State group and build alliances with moderate Muslims to make sure IS does not return. "We must ensure that the forces of militant Islam are defeated," Netanyahu said, adding that jihadists can't be allowed to "drag humanity away from the promise of a bright future to the misery of a dark past." Israeli Prime Minister Benjamin Netanyahu is projected on a screen in Washington as he speaks to attendees of the AIPAC Policy Conference 2017 via satellite from Israel, March 27, 2017, in Washington. Netanyahu called on Palestinian leaders to recognize the Israeli state and work on a peace deal. He said common dangers faced by Israel and its Arab neighbors offer a "rare opportunity" to work toward a safer and more prosperous future. "We teach peace to our children and it's time for the Palestinian authorities to do the same. It must stop teaching hatred, it must stop paying terrorists, it must stop denying our legitimacy and our history," he said. On Sunday, Vice President Mike Pence told the conference the U.S. commitment to Israel is "non-negotiable," and that President Trump is committed to finding a lasting peace between Israel and the Palestinians.